I am actually in the field for the next week and a half, but I have set this post to automatically appear, since I have been so MIA recently. There has been some talk over at Accidental Remediation (AR) and Green Gabbro (GG) about hotel and field vehicle amenities. I thought I would add in field camp needs. I encourage all the other bloggers reading this to add thier own and expand on this psudo-meme! I would love to see what others look for. My husband like to stay in places near food/bar and that has a fun rustic name like the "Waggon Wheel" or the "Rusty Cannon" (we have stayed at both). 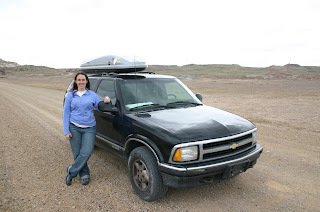 Maria of GG talked in her post about things she most looks for in a field vehicle, such as multiple cup holders, an emergency kit, and a aux input. I love my field vehicle, although it has not been running very well since I decided to get it "fixed" and a few thousand dollars later it is still leaking oil and I am terrified to take it to far out from civilization. I am happy to admit I have all but two of these things this week while in the field. What do you look for in these items? This week and all of next I will be out in northwestern Nebraska doing fieldwork! During the summer, the Geology Department at Augustana College (where I worked last year) offers a 3-credit course entitled "Fossil Mammals of the Badlands." This 2-week course travels to the White River Badlands of South Dakota and Nebraska to learn about the paleontology and geology of the area. The group camps on Shalimar Ranch, outside of Harrison, Nebraska, and collects fossils on privately owned land. This trip has become a tradition, with the first trip in 1982. This will be my fourth trip and we have smaller group this year than last, so that may be a good thing (shorter lines for the shower at least!). I am looking forward to getting out and doing some field work, enjoying the sun (hopefully!) and peace that comes from being in the field. Hopefully this year I will not get sick (last year I got strep throat which ate up most of my field time). You can read about last years trip here, here and here. After the trip I will be heading to Casper, Wyoming to attend the Second Annual Fossil Preparation and Collections Symposium. Hope to see some of you there! Post will resume reguarly the second week of June. Thanks for reading! Thanks to Eric for the heads up. Hello everyone! I am back from the 8th Conference on Fossil Resources and the Advances in Late Cretaceous Paleontology and Geology in the Escalante-Grand Staircase National Monument meetings in Saint George, Utah. These were two really great meetings! I learned quite a bit and had a really good time! Thanks to all of those of you who read the blog for saying hello. It was fun to hear that you keep up with the random things I post here. I was also fun to see one of my blog post/comments on the PRPA worked into a talk! It was hard to pick one talk at the 8CFR that stands out - they were all really good and interesting. I did enjoy the open forum sessions that we had and wish that a few of them could have lasted longer! I learned so much about my current work at this meeting! There are so many things that I was either not aware of or little details that I did not know the whole story on. It was great! There was a nice social mixer the night before the meeting started and a great get together at the St. George Dinosaur Discovery Site at Johnson Farm the next evening. This is a really great museum! If you have never had a chance to visit I highly recommend it! Above: a eubrontes track with radiating mudcracks. Below: tracks from the largest single block of dinosaur tracks on display in a museum anywhere in the world, discovered on Feb. 10. 2004. I really feel like this meeting was a great learning experience and I wish more academic paleontologist had attended. I really think they missed out on some important details, especially surrounding the PRPA and any changes that may be coming up (such as needing permits to collect invertebrate fossils on federal lands, which could happen). Also regarding the PRPA, Ted Vlamis, the Government Affairs Committee Chair for the Society of Vertebrate Paleontology, gave a great detailed keynote address about the history of getting the PRPA passed. It was amazing the amount of time and effort it took to get this bill passed and signed into law! I never realized how much time it took! I am looking forward to sharing an abbreviated version of this history with you soon (I took 3 pages of notes!). There were many good talks at the ALCP meeting. This was a different type of meeting compared to the 8CFR, being more research oriented. Eric Roberts and Zubair Jinnah's talks got my stratigraphy mind thinking about a few research interests I have been tossing around. I missed Ian Miller and Kirk Johnson's talk on the flora of Grand Staircase, but I hear it was really good. Mike Knell gave a good talk about the freshwater turtles of the Monument, which reminds me to tell you all to check out the Gaffney Turtle Symposium (Oct. 17th & 18th of 2009)! The evening of the first day there was a nice social mixer at the hotel where Alan Titus and his band, Zion Rocks, preformed. They were great! The second day was a good, but long day (maybe long because we stayed up to late partying or because I had to be the AV chick all day). It got started off on the wrong foot as I, in my sleep deprived state, had unplugged the USB devices that ran the slide show remote (I though it was just a flash drive someone had forgotten to remove). This messed up poor Barry Albright's talk, and I had to advance his slides manually while everyone else had to hear "next slide" over and over at 8AM. By the next talk we had three working remotes and all was good. There were several good talks in the morning on everything from plesiosaurs, to Deinosuchus in the Kaiparowits and Wahweap formations (in press), to taphonomy of dinosaur bonbeds in the Kaiparowits Formation (one of my favorite talks). Scott Sampson kicked off the afternoon talks with a review of the dinosaur fauna of the monument, with other talks on mammals, birds, theropods, hadrosaurs, and ceratopsains (!). Scott Sampson also closed out the meeting with a great keynote talk on the late Campanian of Laramidia ("West America"), which would have been a very interesting time to have visited. These two meetings were two of the best I have been to in a long time. I hope many of you were there to enjoy them. If not, remember that you can still download the programs and read the abstracts! Have a good week folks! I am off to the 8th Conference on Fossil Resources and the Advances in Late Cretaceous Paleontology and Geology in the Escalante-Grand Staircase National Monument meetings in Saint George, Utah. I may be able to post while at the meeting if I have internet, but if not I will post some notes on the meeting next week when I get back. I will not have a Fieldwork Friday post either this week. I wanted to point out a new blog that some of you out there may be interested in - Burpee Museum of Natural History Blog. This blog, authored by my friends Scott Williams (in picture to left with John at the Hanksville site last summer) and Josh Matthews, will be containing quite a few updates on their field work in the Morrison Formation outside of Hanksville, Utah, which made the national news last year [my blog post on this]. Be sure to add it to your feed. This could possibly be one of the more interesting paleontology field season blogs of the summer! The Museum of Western Colorado has long had a history of working in cooperation with the local federal agencies (particularly the Bureau of Land Management) to help manage and preserve the unique and important paleontological finds of Mesa County, Colorado. Some of the most important areas on BLM land (most within McInnis Canyons National Conservation Area) have been designated as Museum/BLM cooperative management Research Natural Areas, set aside for their paleontological resources. Museum projects with the Grand Junction Field Office of the Bureau of Land Management date back to at least 1976 with the excavation of the type specimen of Ceratosaurus magnicornis from the Fruita Paleontological Area (FPA). 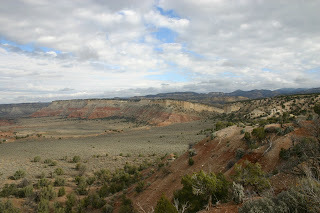 With the 1981 discovery of the Mygatt-Moore Quarry (MMQ) in Rabbit Valley, the museum began a 25 year working relationship with the local BLM field office to study this locality in the Morrison Formation, one of the largest dinosaur sites in the unit. Further work in the BLM lands of Rabbit Valley has included the excavation of the Averett Camptosaurus in 1982 and the Bollan Stegosaurus in 1986. Other activities in Rabbit Valley have included the construction of the Trail Through Time. This mile-and-a-half loop trail takes visitors through an interpreted hike along Jurassic-age river channels. An interpretive kiosk at the trail head describes the flora and fauna of the Morrison Formation as well as activities that take place at the Mygatt-Moore Quarry. Explanations of fossilized bones seen in situ are given on interpretive panels along the trail. The Museum also worked with the local BLM field office to build a trail though the Split Rock area of Rabbit Valley. This developed trail leads the public though a Jurassic-age river channel that has produced a high abundance of dinosaur material, including a partial skeleton of the small ornithopod Othnielosaurus. In 2002-2003, with assistance from the BLM, the museum worked to salvage an Allosaurus skeleton that was being vandalized along the Split Rock trail. In 2004-2005 an articulated Apatosaurus was removed from maroon mudstone in the Twin Juniper Quarry in Rabbit Valley. The Museum has worked with Colorado National Monument resource managers to inventory Jurassic tracksites in the Wingate Sandstone in the canyons of the monument (mostly Grallator trackways), and to collect, preserve and study only the second known set of turtle tracks from the Morrison Formation. Elmer Riggs of the Field Columbian Museum excavated an Apatosaurus in Fruita, Colorado, at Dinosaur Hill, in 1901. This site is important because the specimen led to Riggs’s recognition that Apatosaurus and Brontosaurus represented the same animal. A trail was installed at this site in 2003 to interpret the unique history and paleontological resources of the area. A trail at the nearby FPA was installed in 2001 to interpret the globally significant mammal fauna of the Morrison Formation found there. 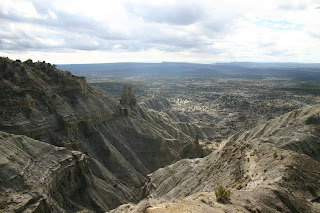 The trails at Dinosaur Hill and at the FPA are cooperative efforts managed by the Bureau of Land Management, the Museum of Western Colorado, and the City of Fruita. The Late Jurassic-age Mygatt-Moore Quarry is located in the middle Brushy Basin Member of the Morrison Formation. Excavations have taken place every year since 1984 (25 seasons) at the Mygatt-Moore Quarry. On this BLM-managed land the Museum leads public fossils digs for four months a year, with 250-350 public diggers per year participating under the supervision of staff paleontologists. This hands-on opportunity gives the museum the opportunity to convey important scientific information, while also education the public on the importance of stewardship and fossil resource protection on federal lands. Over 800+ cataloged specimens from seven species of dinosaur, including the type specimen of the first Jurassic ankylosaur Mymoorapelta, have been recovered from this bonebed. The most abundant taxon at the quarry is the theropod Allosaurus (29%), which is represented by 233 skeletal elements indicating a minimum of 6 individuals (5 adults, 1 juvenile); in addition, more than 190 mostly shed teeth of Allosaurus have been recovered from the site. The sauropod Apatosaurus is next most abundant (20%) with 160 elements representing 5 individuals (3 adults, 1 sub-adult, 1 juvenile). Approximately 19% of the sample consists of bones of the ankylosaur Mymoorapelta, mostly osteoderms and lateral spines (2 individuals). The three most abundant sauropods in the Morrison Formation (Camarasaurus, Apatosaurus, and Diplodocus) also are preserved at the Mygatt-Moore Quarry, but unlike within the formation as a whole, at the MMQ Apatosaurus accounts for 85% of the sauropod bones at the site; in the formation overall, Camarasaurus is the most abundant sauropod. Also preserved at the site are the carnivorous dinosaur Ceratosaurus (6 teeth) and the small ornithopod dinosaur Othnielosaurus (one jaw fragment), the latter first identified during the 2008 season. Non-dinosaurian taxa preserved at the site are very rare but include a turtle, a crocodilian, and a probable pterosaur. Above the main bone layer at MMQ is a shallow lake deposit, which preserves some of the only articulated fish skeletons in the Morrison Formation, including “Hulettia” hawesi and the type and referred specimens of Morrolepis schaefferi. Also found in this unit have been the fish cf. Leptolepis and an as yet unnamed crayfish. Museum of Western Colorado and the Grand Junction Field Office of the BLM are investigating the possible installation of a permanent protective building over the Mygatt-Moore Quarry. Given the abundance of large, well preserved dinosaur bones at this site, the building could serve as a permanent and educational exhibit that would help to interpret the quarry in the long term, while also providing year-round access and a secured, on-going excavation area. Here is an oldie to tie us over till I have something new to share. 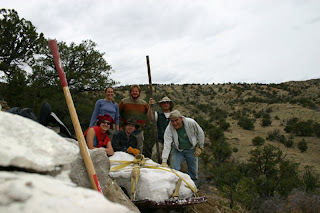 I had the opportunity to do field work with the University of Utah's Paleo group in Grand Staircase/Escalante National Monument from October 22- 29, 2004. It was a great time, and I appreciate the chance to work with some wonderful paleontologist, while also having a new field experience and making some new friends. I did this field work while trying to complete my next to last semester of grad school. It was a very stressful time in my life and I needed a chance to run away and get out of town. This fieldwork was just what I needed. It came at a time when I needed to just relax and work on something else. My friends were doing some work in the Kaiparowits and Wahweap Formations (Campanian; Upper Cretaceous in age), much of which will be talked about next week at the Advances in Late Cretaceous paleontology in the Escalante/Grand Staircase National Monument meeting. Check out the abstract book to see some of the research details. Jella & Eric working to winterize a site where a theropod was later excavated. At this site I helped the crew remove a very large, beautiful hadrosaur skull that had skin impressions perserved around the neck region. This specimen was perserved in a Kaiparowits sandstone. You can read more about dinosaur skin impressions that have been found on many specimens within Grand Staircase on page 38 of the program and abstract book for the Advances in Late Cretaceous paleontology in the Escalante/Grand Staircase National Monument meeting here. The morning of the 29th we awoke to this! 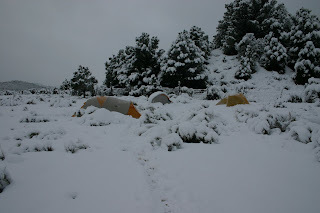 About a foot of snow had fallen overnight and that ended the field season for that year. Sorry I do not have more to share from this trip. It was 5 years ago (hard to believe!) and difficult to remember to many details. Here are some more pictures from this trip. Here are two pictures of a Collard Lizard I took a few weeks ago while doing field work. He was very calm and happily sunning himself on a rock, and was not to concerned with me. I took quite a few close up pictures. These were two of the better ones so I thought I would share them (due to lack of anything else to post at this time). The program for the Advances in Western Interior Late Cretaceous Paleontology and Geology Conference is now available! Check it out here. I know I am looking forward to seeing talks at 10:40 and 3 on May 23 (among many others)! After a long break, here is another episode of Fieldwork Friday. This was the last of our spring trilobite collecting trips for this year. We headed out to the House Range of west-central Utah (west of the town of Delta), long known to be a trilobite collecting mecca of sorts. I had never visited this area before, but had long heard rumors that trilobites there are so common you could just pick them up off the ground. These are the common types of trilobites (usually Elrathia kingi) that you will see in nearly every rock shop across the United States. John was interested in visiting to gather some more data for his presentation at the International Conference on the Cambrian Explosion. The trilobites we collected were from the Middle (to Late?) Cambrian Wheeler Shale, Marjum and Weeks Formations. Lucky for us we had a friend along who was familiar with the area and could show us some good collection localities. But it is not hard to see where others have looked. As you drive into the area it is pockmarked with hundreds of holes. It is kind of sad (to me) to see the area just destroyed all in the name of looking for trilobites. There are really no regulations it seems to keep people from doing this. 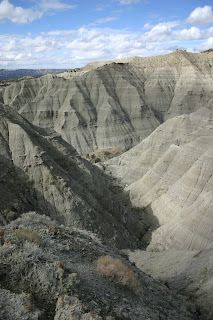 The land in this area is mostly BLM land, and it is legal to collect a reasonable amount of common invertebrate fossils. But this is where the trouble starts. It appears that many people in the area operate "Flagstone quarries." The one I visited had already been shut down by the BLM, but sadly these people left a HUGE hole in the ground, large amounts of trash, and nearly a hundred banded up, ready to go, pallets of rock. Those are hundreds of inarticulate brachiopods (Acrothele?). I would guess they classify as a "common invertebrate fossil." But the BLM website clearly states "If you wish to collect common invertebrate or plant fossils for landscaping, sale, or commercial purposes you must apply to the BLM for a mineral materials sale." [link] I guess these people had not done that, or were being deceptive and selling trilobites. Who knows?! We observed trilobites in these pallets of rocks. The trilobites at this site however would typically require some sort of preparation (air abrasion). It was cold and windy most of the time we were there, which was not a blast, but at least it was not raining or snowing. The last day was great - sunny and warm. We took the dog again and he seemed to have fun. The shales were pretty easy to split. The limestones required a little more muscle, but were nice to work with. We found more complete trilobites here than we did in either the Marble Mountains or at Spence Gulch, but they are often missing their cheeks. We also spend a morning looking for eocrinoids (Gogia). We found two. There were also commercial collecting spots located in this area where you can actually pay these people to dig up rock with a back hoe and give it to you to sort though, so you can find your own trilobites. Seems barbaric and like cheating to me, but that is just my opinion. Why in the world would you pay people to do this for you when all you have to do is get out of your car, walk 100 yards and look down. Seriously, it was that easy in most areas. Looks for some shale and then look down. I guess if you did not know what you were really looking for, but it seems like a waste of money to me. In the first picture below you can see the number of trilobites we surface picked at one site. But what about that one person...the one always depicted in the movies and in books. The person that represents paleontologist all over the world in popular culture. Who are they? What type of person are they commonly? "Why do archaeologists outnumber paleontologists on bookshelves and in movies? I'm trying to make a list of fictional paleontologists beyond Ross, Bringing up Baby, and Amanda Quick's Ravished (and I decline to include any of Michael Crichton's characters). I'm sure you and your readers know waaaaay more about this, so please clue us clueless writers in at Damned Scribbling Women." What do you think folks? Feel free to leave her some comments here or over on her blog where they are having a "contestosaurus". She is going to pick a winner Sunday, May 10, so feel free to get those comments in soon! The advanced program for the 8th Conference on Fossil Resources is now available for download online here (PDF). Check out the great line up of talks. I think this is really going to be a great meeting to attend. Looking forward to seeing many of you there! I am also still soliciting comments for my post on "Keep your head down? What would you do?" Please give it a read and let me know what you think. There are a few great comments already but I would like to hear more perspectives. Keep an eye out for another instalment of Fieldwork Friday and an update on my poor boots! Keep your head down? What would you do? As Bill pointed out, Janet Stemwedel from Adventure in Ethics and Science recently posted a story about "standing against bad behavior and standing with the members of the community who are harmed by it". As well, if an advisor is trying to protect a trainee from harm in these discussions within the tribe, I think the advisor may have a responsibility to get involved in those discussions. Especially around cases like Aetogate, where the central charge was that plagiarism and claim-jumping was being committed against junior people in the field by senior people in the field, senior people who do not speak up to protect the interests of junior people cannot expect that junior people in the field will not raise their voices to protect their own interests. The silence of senior people in such cases also speaks to junior people: it says"We don't care." Sympathizing in the privacy of a research group does very little to address conduct that causes harm to members of the scientific community. If the grown-ups in a scientific community don't take it upon themselves to police the bad actors and to develop standards that help the whole community work together to build a reliable body of knowledge and a group of responsible practitioners, who on earth will?" For example, what would you do in this situation: You are studentA, working on your thesis project. You find out towards the completion of your project that studentB from another school was allowed by your advisor to look at your specimen and do their own work on it (for inclusion in a larger project). StudentB is aware that you are working on this specimen for your thesis research. You find out after graduation that studentB has published a paper on your specimen before you can (as a stand-alone specific piece on the specimen and NOT as part of a lager body of work just mentioning it), preempting and not acknowledging your prior work. What do you do? Is this another case of scooping (this time student scooping student)? Would the right thing have been for studentB to contact studentA and let them know they are working on it also and ask when/if studentA is going to publish on their thesis research? Should studentA just get over it and keep thier head down? What is the right or ethical things to do here? How is this similar or diffrent from the Aetogate controversy? How long do you, as a scientist, wait for a specimen to be published on beforeyou publish something on it yourself (assuming they have done work on the specimen prior to you)? Hi everyone! Sorry for the overly long departure! I thought I would have time to do a few blog post when I returned from my vacation, but I left the day after returning home for nearly 2 weeks of field work (who can complain about that!). So I apologize for my week vacation from blogging turning into a 3 week MIA. I am still getting caught up on things here at home and work, so I hope to get caught up with some new blog post very soon! Until then, I thought I would share a recent (non paleontology/geology related) story that I read while in the field. In this months issue of National Georaphic Adventure they had a story about Everett Ruess. I had never hear of Ruess until I read Into the Wild where he is talked about for several pages, and had forgotten about the story until I read about it in the magazine this month. It is an interesting story about Ruess, who was a 20 year old Californian artist and writer who traveled around the American Southwest in the early 1930's. He disappeared in 1934 (last seen in Escalante, Utah) and no one ever knew what happen to him. Enter the modern day: Daisy Johnson, a New Mexico Navajo native, told her brother, Denny Bellson, a story she had heard about their grandfather. Daisy had cancer and contacted a medicine man about the problem. The medicine man informed her that the cancer was because of something her grandfather (whom had also had cancer) had done in the 1930's. Their grandfather had seen a white man ridding though a canyon near his home and witnessed the murder of this man by Ute Indians. When he went to check on the man he found him dead, and rather than leaving him in the canyon, moved his body up to the side of the canyon for burial. Some time after when he got cancer the medicine man told him he would have to preform a ceremony to rid the man of his cancer, which involved revisiting the burial site. Their grandfather lived for another ten years. Now the family curse was visiting Daisy. Could the white man their grandfather had seen be Everette Ruess? The site is investigated by archaeologist, forensic anthropologist, and even the FBI. Read the story here to find out the entire story - it is really an interesting read (and then read the recent press release about DNA results from the remains)!